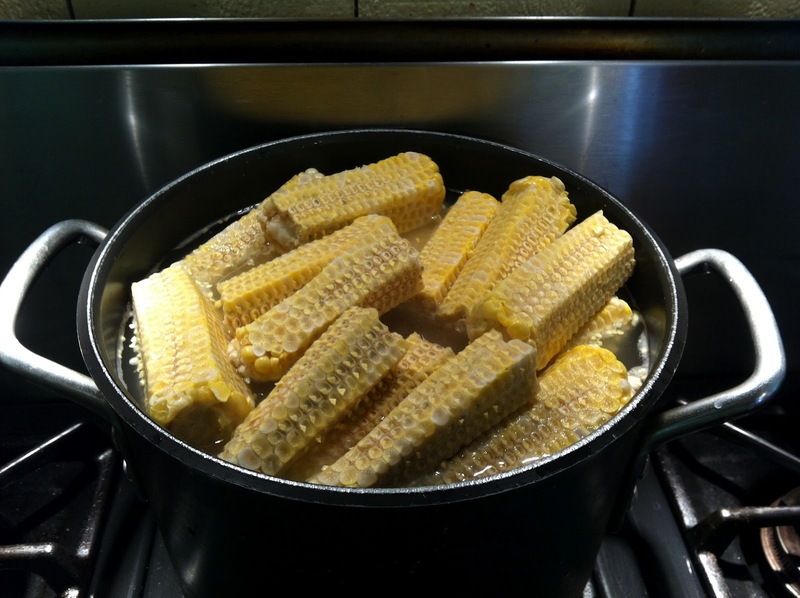 I can’t get enough corn these days…it’s been an incredibly sweet year. So to prolong the season I spent an hour shucking and bagging thirty ears so I could savor it all winter. To start I got a large pot of water boiling and after husking in batches of six I dropped the ears into the simmering pot for two minutes then quickly into a waiting ice bath. Then it was just a matter of cutting the kernels from the cobs and spooning them in freezer bags. But don’t throw out those cobs. Break them in half and put them back in the pot and boil for about three hours or until the liquid is reduced by at least three quarters. It helps to rotate the cobs half way through. What you end up with is a concentrated corn stock that’s unmatched for soups, risotto, or pasta sauce. Try a corn and potato vichyssoise, or roast corn and leek risotto, only this time of year will they taste this good.